A playlist is a group of tracks that you can save and listen to at your leisure. Give your Spotify playlist a name, add a selection of tracks to it, and there you have it — your very own playlist. Okay, so there are a few tricks to creating a playlist; but essentially, that’s what it involves. 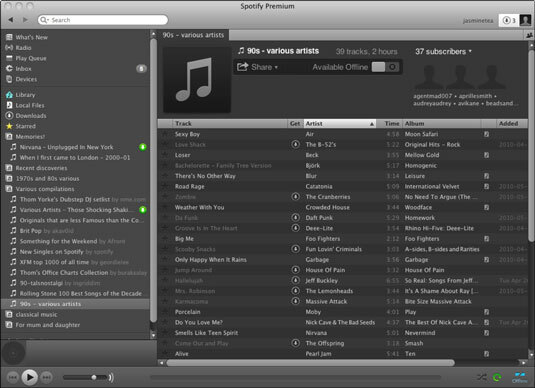 Playlists appear on your left sidebar in Spotify. Click a playlist to view it in the main window. Here, Spotify is in Offline mode, which means it’s not connected to the Internet, but you can still view and edit your playlists. Next time you go online, Spotify will access and store your latest playlist information. If you want, you can arrange your playlists in folders and put them in your desired order. There’s no rule about what you can include in a playlist — your imagination is the only limit. You can add up to 10,000 tracks to a playlist —the option is there if you want it! You can compare Spotify playlists to mixtapes, but actually that’s only part of the playlist story. According to Spotify, around 30 percent of playlists actually consist of whole albums, rather than a mix-and-match collection of songs. One limitation to Spotify at the moment is you can’t easily view songs you like by artist and album, like you can with an iTunes library. You need to put any tracks you want to save until later into a playlist (or, alternatively, star them — your folder of starred, or bookmarked, tracks acts like one giant playlist in itself, even though it isn’t strictly categorized as one and has its own special folder). After you have more than a few dozen playlists, you need to organize them in a meaningful way; otherwise, it can be hard to find the playlists you want. Another drawback is that you can’t automatically sort playlist titles and folders alphabetically for easy access; you need to manually shift them around in the order you want. When Spotify brought in folders and subfolders for playlists, organizing your playlists became a whole lot easier. Playlist folders were recently made available on the iPhone app after a long wait (previously, playlists could be viewed only in one long, relentless list). Syncing playlists to your iPod classic, shuffle, or nano music players is also possible, provided you own the playlist tracks as local files on your computer. Any tracks you don’t own can’t be copied onto an iPod. Use the mobile app if you want to listen to songs from Spotify’s streaming library when you’re out and about (you’ll need a Premium subscription).